You meet the love of your life. Charming, attractive, confident, attentive, like you in many ways… what more could you ask for? Maybe you even tie the knot. Then gradually you begin to notice a change in your partner’s behaviour towards you. You experience unwarranted criticism, outbursts of jealousy and anger or… perhaps hardest of all to deal with… the silent treatment. You are confused as to what you have done to deserve this. Subjected to this abusive behaviour, you start to feel inadequate. You may even begin to doubt your sanity. But it’s not you. You are in a relationship with a narcissist. What is a narcissist and how do you recognise narcissistic personality disorder? Given that a trait of narcissists is the ability to destroy the self-esteem of others, narcissism can be very difficult to identify…because we assume that we are at fault in the relationship. 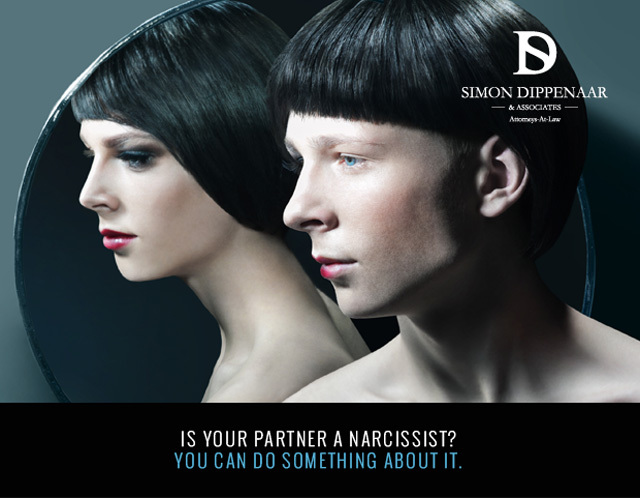 We don’t consider that it might be the other person… the narcissist. Where does the term ‘narcissism’ originate? If you’ve ever studied Greek mythology you may remember that Narcissus was a beautiful young man who fell in love with his own reflection. In fact, it’s a bit more complicated than that. He fell in love with the image in the pond, not realising that it was his own face reflected back at him. He drowned, unable to leave behind the beauty of his image. He was proud and disdainful of others; thus his name is the origin of the term narcissism, a fixation with oneself and one’s physical appearance. Narcissism is generally accepted to be more than simply an obsession with one’s looks, a trait which is more commonly called vanity. Vanity may not be an attractive quality but one can be vain without being a narcissist. In fact in psychological circles a distinction is made between narcissism and narcissistic personality disorder, the latter being a much more extreme and dysfunctional version of the former; but laypeople tend to use the terms synonymously. Individuals with narcissistic personality disorder generally believe that the world revolves around them. They typically have an inability to empathise with others and need to be the focus of attention at all times. Narcissists are often arrogant and display a complete lack of empathy for other people. They have a persistent need for admiration, which must be constantly forthcoming at work and especially in relationships. They possess a distorted self-image, unstable and intense emotions, are overly preoccupied with vanity, prestige, power and personal adequacy, and have an exaggerated sense of superiority. How can you tell if your partner is a narcissist? If your partner behaves like this, it can be utterly debilitating to your mental health. Clinical treatment is rare because most narcissists avoid therapy. Narcissists can learn to be more caring about others, especially when included in social groups; but the process is exhausting and you may become very damaged along the way. Sadly, most of the time the only constructive solution for the individual trapped in a narcissistic relationship is escape. For your own mental wellbeing you need to remove yourself from the source of the destruction – the narcissistic partner, especially if you have children. This can be difficult to do, especially since you have probably normalised your situation so that you don’t recognise the abuse for what it is, or you blame yourself for any problems in your relationship. You are not crazy. And help is available. A good psychologist will help you see how you are being manipulated and empower you with coping strategies and solutions to recover your mental stability and move forward in a proactive way. Most medical aids will cover therapy sessions and there are many free counselling services available. Lifeline in Cape Town is contactable on 021 762 8198. If you resolve to end the narcissistic relationship, we will handle the dissolution of your marriage or partnership sensitively and carefully. You’ve been through enough already. SD Law & Associates are experts in divorce and family law. Contact us on +27 (0) 86 099 5146 or 076 116 0623. Or email sdippenaar@sdlaw.co.za. Your query will be handled with discretion and compassion. This entry was posted in Narcissist and tagged narcissism, narcissist, narcissist relationship help, narcissistic behaviour disorder. Bookmark the permalink.